Thirteen courses of meticulously prepared sushi may feel incongruous in the middle of a busy food hall, but for $35, you just go with it. For most college students, food hall dining means some eclectic mix of uninspired salads, make-your-own taco bar, and unlimited soft serve—all things considered, a totally-fine first foray into feeding yourself. But at the University of Pennsylvania’s recently unveiled food hall, Franklin’s Table, the stakes have been raised; vendors sell grass-fed beef burgers, small-batch ice cream, and a shockingly good omakase. Open to the public, DK Sushi is offering rolls and sashimi for take out, plus a $35, multi-course omakase experience, smack in the center of the bustling campus food hall. Tune out students and staff from the nearby Hospital of the University of Pennsylvania buzzing behind you and settle onto one of four counter stools for a relatively fast-paced, thirteen course meal. Chef Yun Fuentes, hailing most recently from Alma de Cuba, kicks it off with classics —a bowl of steamed edamame and miso soup—before the 10-piece joyride that includes delicate hamachi brightened with lemon and layered with cucumber and tempura crisp, flash-cured salmon loin rubbed with ginger, broiled freshwater eel atop a sushi rice hashbrown, and a piece of Wagyu beef tataki dotted with heart of palm salad maki and tender sea urchin. The grand finale is a mini hand roll of pan-seared Hudson Valley foie gras, lightly basted with miso caramel, yuzu, serrano chiles, and scallions, and finished with toasted rice pearls. And for dessert: two chewy, technicolored macarons, one matcha and one yuzu, care of Schulson Collective executive pastry chef Andrew Ling, fresh off an eight-year stint at Bouchon in New York City. Each of the thirteen courses of meticulously prepared sushi is presented in an efficient, yet ceremonial, way that feels slightly incongruous in the middle of a busy food hall. For $35, you just go with it. Before its recent revamp, Franklin’s Table was Moravian Food Court, home to Pizza Hut and Taco Bell, among other more traditional student staples. (If you went to college and didn’t collect couch change to eat at Taco Bell on the regular, did you even go to college?) Now, inside the 8,000-square-foot, industrial-sleek space, seven food and drink vendors include Michael Pasquarello’s KQ Burger, Goldie, the vegan falafel spot by chef Michael Solomonov’s CookNSolo, food truck-turned-brick and mortar Pitruco Pizza, and DK Sushi. Part of Schulson Collective, the restaurant operates alongside popular sister spots like Harp & Crown, Independence Beer Garden, and Double Knot, the all-day coffee shop with subterranean sushi bar and izakaya. 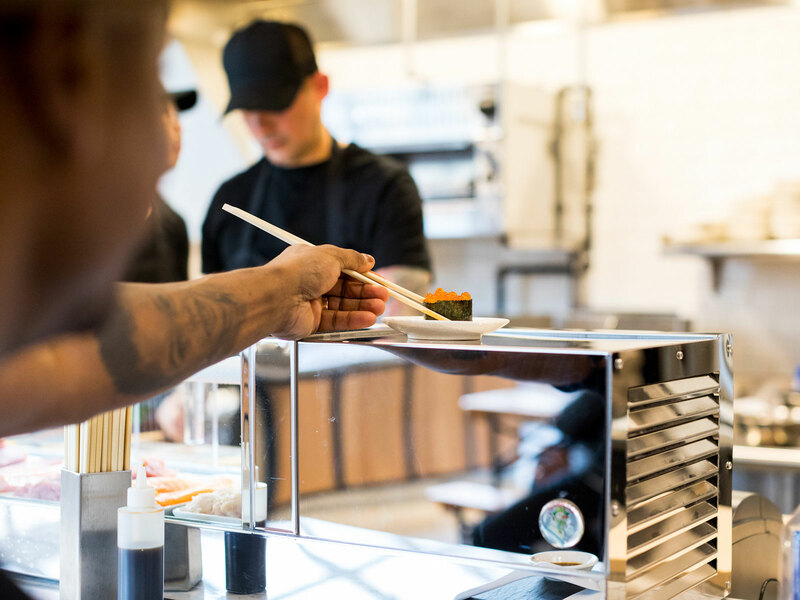 In a first for the company, DK Sushi is a fast-casual concept that specializes in high-quality sushi, only with a speedier process. Instead of a host, computer kiosks greet guests, who can place orders for eel and sesame sushi or salmon sashimi with the tap of a few screens. There are à la carte spicy tuna rolls and bowls of miso soup, or, starting at $16, a highly conceptualized chef’s box with salmon or another fish, ready to be taken to a communal table inside, out on the sunlit patio, or back to a dorm room. 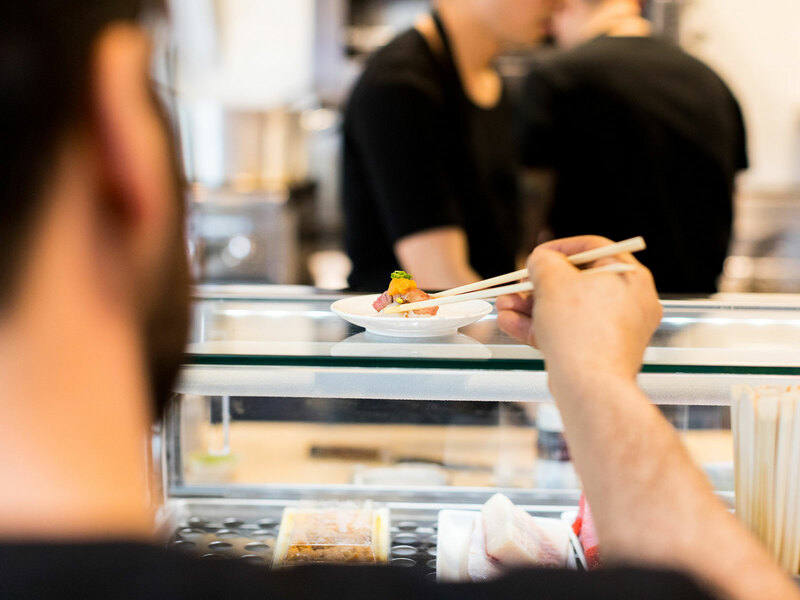 For Schulson and his wife and business partner, Nina Tinari Schulson, the idea for fast casual sushi came about when Double Knot customers kept requesting sushi to go. But the restaurateur says they stayed away from take away for several reasons, including the inability to control the quality. The tiny space is new, too. In a departure from the sprawling, 12,500-foot Harp & Crown, or Independence Beer Garden, DK Sushi is compact, while still maintaining the company’s aesthetic. And while it costs more than couch change, students can consider the omakase a post-finals splurge or unconventional date night, and everyone else can consider it when the urge for fresh sushi hits.